One-third of food produced for human consumption is lost or wasted globally, which amounts to about 1.3 billion tonnes per year. REFRESH aims to contribute significantly towards the objective of reducing food waste across the EU by 30% by 2025 (which amounts to 25-40 million tonnes of food not being wasted in 2025, worth tens of billions of Euros) and maximising the value of unavoidable food waste and packaging materials. As part of valorisation of waste streams and co-products (WP6), the top 80 products and their associated 291 waste streams were identified, based on consumption volume and environmental impact. This information was used by Quadram Institute (UK) and EuroFIR (BE) to develop a user-friendly internet-based state-of-the-art database (FoodWasteExplorer) providing immediate compositional (e.g. nutrients, bioactives, toxicants) data on these waste streams for evaluating food waste, addressing quality, safety, sustainability, legislation and costs, which can help support valorisation decisions made by those producing the waste and those involved in waste utilisation and valorisation. Such databases are available for food composition, but are lacking for food waste streams. 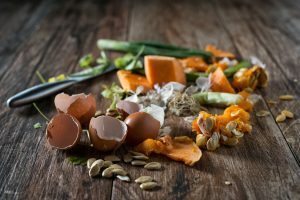 Currently, more than 25,000 data points have been identified from several a variety of sources, including published scientific papers, manufacturers data and established databases, and incorporated in the food waste database. This work is still ongoing and more data will be added, but FoodWasteExplorer will be launched in early November 2017 and is ready for testing. A new digital network has been launched to encourage collaboration and bring together expertise from Europe and beyond in a focussed response to the global issue of food waste. The Community of Experts (CoE) aims to help drive action at every level of the supply chain by empowering individuals, organisations and nations through the sharing of skills, knowledge and resources needed to act against food waste. INHERIT is an H2020 research project that aims to change lifestyles and behaviours, with strong consideration for the socio-economic contexts that people live in, to support the transition to more sustainable societies. It explores what kind of policies, practices, and innovations in the areas of living (green space and energy efficient housing), moving (active transport) and consuming (food and beverages) contribute to lifestyle and behaviour change to achieve a tripe win: protect the environment, improving health and contributing to greater health equity. This workshop brought together over 50 participants from civil society, European institutions, national health institutes and ministries to brainstorm, debate and advance four scenarios for a more sustainable future in Europe. To read the presentations of this workshop, please visit the project website here. To mark the British Nutrition Foundation’s 50th anniversary, a Special Issue of Nutrition Bulletin, ‘Nutrition science past and future: Celebrating a multi-disciplined approach’, has brought together world-leading nutrition scientists to celebrate how research in a range of academic disciplines has contributed to significant advances in understanding about the relationships between diet and health over the last 50 years. The Special Issue illustrates how a multi-disciplined scientific approach, and collaboration between the scientific community and industry, can have a positive impact on health outcomes. Underpinned by a multi-disciplined research approach, twelve articles have been published in the Special Issue, highlighting work in the areas of nutrition science methodology, epidemiology, biochemistry, behavioral science, food science and technology, biomedical science, and epigenetics. To access the Special Issue, please visit the Nutrition Bulletin website here. This conference brought together leading researchers and organisation in food waste prevention, reduction and valorisation, and topics for discussion included social entrepreneurship, economics of food waste, consumer behaviour, food packaging policy, prevention of food waste and business practices as well as reuse, reduction and valorisation. Beneficiaries presented the latest results and ongoing work in REFRESH. Winners of the REFRESH contest for food waste solutions presented their projects, and several interactive networking sessions brought practitioners together with policy-makers and entrepreneurs. The Innovator Fair offered delegates a chance to explore successful food waste initiatives from across Europe. WRAP is working with UK Governments and the Food Standards Agency (FSA) to update industry guidance on the application of on-pack date and related advice (storage and freezing guidance). The guidance aims to assist further reductions in food waste at home and remove key barriers to redistribution. It will cover what the different date labels mean, and how best to decide which date to apply in relation to curtailing food waste (and the consequences of this decision); the importance of maximising both ‘closed’ and ‘open’ life, whilst ensuring quality and safety are maintained; the importance of correct storage guidance, including fridge temperature and freezing advice; and what can (and cannot) be done as the date approaches / is past (for sale / redistribution). The consultation is open to all, particularly large and small food businesses from the retail and hospitality and foodservice sectors, food producers and manufacturers, those involved in the redistribution of food surplus and those responsible for enforcement of food safety regulations. You can download the draft guidance here. It is available for review and comment until 3rd August [4 weeks in total]. Claims made on plants and their preparations, as well as the general regulatory framework and their preparations, as well as the general regulatory framework for their use in foods. The study is led by Agra CEAS Consulting (FCEC). The evaluation forms part of the Commission’s Regulatory Fitness and Performance Programme (REFIT) and will provide inputs for the REFIT of the NHC Regulation with regard to the above aspects. The study methodology envisages the extensive consultation of Member States Competent Authorities and all stakeholders directly or indirectly affected by these issues, including business, consumers and other non-business interest groups. Consultation with stakeholders was launched in a workshop held in Brussels on 21 June 2016 in the context of the Advisory Group on the Food Chain, Animal and Plant Health. Consultation with Member State Competent Authorities was launched on the same day in a workshop held in the context of the Member State Working Group of the PAFF committee - section nutrition and health claims. In the framework of this evaluation, Agra CEAS Consulting is hereby launching an on-line survey of organisations representing stakeholders, including consumers, relevant business operators, and public health interest groups, whether set up at EU or national level. The online survey can be accessed here. Research scientists are welcome to respond on behalf of their organisation, by clicking on non-business part of the questionnaire. We encourage you to disseminate the link to this survey, as quickly as possible, to any other relevant organisations. The weblink to access the survey is not respondent-specific and can be sent as such to other potential respondents. More information on this study, including the terms of reference, can be found at the DG SANTE website: https://ec.europa.eu/food/safety/labelling_nutrition/claims/refit_en . The survey will remain open until 17 February 2017.